Some weeks ago I had a little talk on IRC about shift-mainline games and numbers of trains. Personally I really like the SML concept, and I wanted to know if it is possible to squeeze more than 2000 trains into a single game and still get a fluent network. 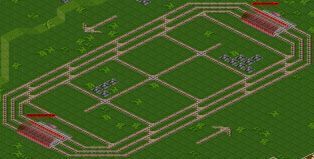 The SML concept seems optimal for huge OpenTTD tasks, so I focussed more on it. After a first game with some planning mistakes I started a second one, now knowing what problems might arise during the game. The layout is quite simple: one huge counter-clockwise roundabout mainline, starting at 2 lanes and offering enough space to add further outer lanes during the game. All the industries are connected by 6 split/merge hubs. The layout of the “inner” network is quite chaotic though and could receive more focus in further games – but overall it worked so well that I didn’t mind much about it. On some of the inner lines I had to add a second lane, but that’s it. Coal, ore and wood go to the western station, steel (from the western station) and livestock to the eastern one. Goods and pax/post are transferred between both main stations using only the roundabout. All trains are TL 8 (2 heads + 6 waggons) to get a huge amount of trains. I decided to use monorail as a nice mixture of speed and not-too-much speed to keep the number of trains high. Apart from that I added a few maglev train and bus lines for local pax transport in the 2 main cities to grow them faster. When I was running ~600 trains, the 2 lanes of the mainline started to get crowded. 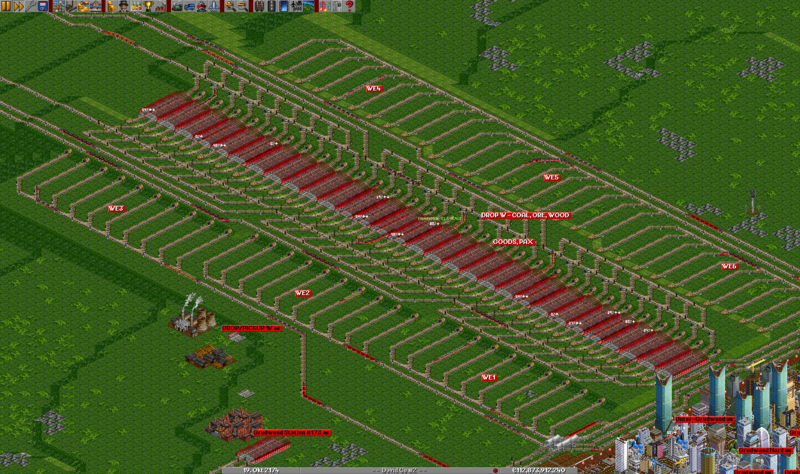 I added a third lane and pushed the capacity up to ~800 trains. The fourth lane allowed to increase up to ~1200 trains. But then I had to face another problem: the main stations were too small. In the beginning I decided to use presignal bypass stations for my main stations. I made them ~50 tiles wide and 4 tiles long and started connecting them to my mainline lanes, without thinking too much about optimization. 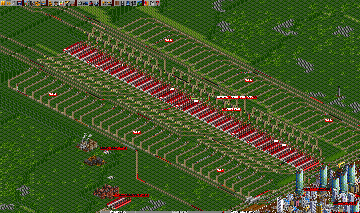 This proved difficult when I had to optimize them, having 1200 trains moving around all the time. 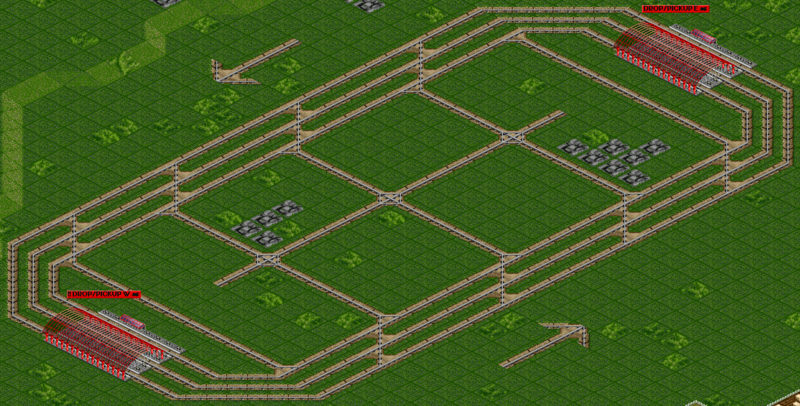 I increased the width to 60 tiles and optimized the bypass layout to allow for 6 different connecting lanes using 10 platforms each. Watching the game I had found out that for unloading + loading 10 platforms for each lane would be sufficient. Later on PhazorX told me that 6 platforms are enough for unloading or loading only, so I think this comes quite close. I also re-ordered the output of the main stations, so that all incoming lanes got out in the same place (the innermost lane stays the innermost and the outermost stays the outermost). The goal of this was to move the roundabout trains to the outermost lanes (because they never had to split off and merge in again). If you don’t need this behaviour, the mixing of the lanes doesn’t matter at all! After optimizing the main stations I could easily add 2 further lanes – these became the new outermost lanes 5 and 6. In the end they took mostly constant roundabout traffic as planned previously, so this worked fine. Another thing I had feared happened, though: I had to switch to my newer Core 2 laptop computer, because my Athlon XP 2400+ wasn’t able to calculate the whole game efficiently (at ~1000 trains the fast forward mode was already the same as the normal game speed). It was quite hard to find further good industries to get more cargo going, but I managed to push the game up to 2033 trains on my huge network. If your PC is fast enough, you can see that the network is quite fluent. Sometimes one of the lane shifters hangs (this is due to a flaw in the shifter design and I couldn’t find out how to solve this) but the rest of the game is fine. How can this be topped? Well, it’s actually quite easy: provided that the map has enough ressources to transport, one could walk the main stations and add another 6×10 platforms, increasing the capacity to 12 mainline lanes. I fear though, that both the ressources and the available space are too low on this particular map, so this could be tried on an even larger game. Another thing to be considered by the organization freaks out there is to separate the networks of the various cargo types. This would lead to a more ordered game with even more efficient stations (not needing to cramp everything into 2 big stations but splitting them up).